On Monday 31st March Information Services will activate an additional security feature for users of our Windows 7 Managed Desktop. From the 31st March, if any unknown program attempts to run from within your User Profile folder (malicious programs nearly always run from your User Profile folder), an additional verification step will warn you about the program. You will be prompted by the message below. If you don’t recognise the program, click Cancel! 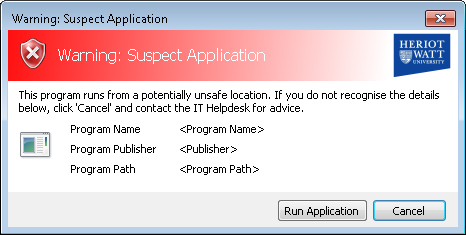 Do not click “Run Application” unless you are sure the program is safe. Malware is one kind of harmful external hazards that installed from one device to another but the owner is not familiar with such kind of malicious installation process. It is the proper time we have to aces for such malware protection factors to secure the device from all these external hazards.